Be the first to share your favorite memory, photo or story of Mavis. This memorial page is dedicated for family, friends and future generations to celebrate the life of their loved one. 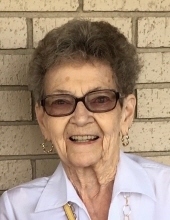 Mavis Adair Hanson, age 85, of Ames and formerly of Dubuque, passed away on February 5, 2019 at Northridge Village in Ames. Born on February 13, 1933 in Rutland, Iowa. Mavis was the daughter of Norris and Evelyn (Cook) Klevos. She graduated from Mason City High School in 1950. Mavis was united in marriage to O. Eugene Hanson on August 1, 1953. Mavis attended Drake University and graduated with a bachelor’s degree from the University of Dubuque. Mavis taught kindergarten in the Dubuque School System and retired in 1995. She was a member of St. John’s Lutheran Church in Dubuque. Mavis played the piano and was the accompanist at many high school musical events. During her retirement, she enjoyed playing golf and getting together with other members of the Retired School Teacher’s Association. Mavis loved quilting and created heirloom quilts for each of her grandchildren. She had an unforgettable sense of humor, a quotable way with words and an impeccable sense of fashion. She made the holidays special, and had a knack for giving one-of-a kind gifts. Her grandchildren are hoping to continue her legacy of extraordinary generosity and love and of valuing education and encouraging women to be strong. Mavis is survived by two sons: Scott (Kathy) Hanson and Steve Hanson both of Ames; six grandchildren: Alex Winchester, Hosanna Hanson, Michael (Mandy) Hanson, Devon (Jean) McClurken, Rebekah (Kerry) Johnson, and Mary (Devin) O’Bannon; four great-grandchildren: Troy Winchester, Olson McClurken, and Elouise and Warren Johnson; a sister, Cynthia (Frank) Kawai of Indio, California; and sisters-in-law, Karen Klevos and Sue Klevos. She was preceded in death by her parents; her husband, O. Eugene; brothers: Dan Klevos and Paul Klevos; a sister, Vergene Krahn; and her special friend, Lyle Scheppele. Graveside services will be held at a later date. Funeral arrangements are under the direction of the Adams Funeral Home and online condolences may be left for Mavis’ family at www.adamssoderstrum.com. To send flowers or a remembrance gift to the family of Mavis Hanson, please visit our Tribute Store. "Email Address" would like to share the life celebration of Mavis Hanson. Click on the "link" to go to share a favorite memory or leave a condolence message for the family.